Sherri D. Sutton’s childhood did her in. Her mamma, she says, used to beat her with the Bible Belt. No wonder she turned into a stand-up comic, whose raunchy solo show Don’t Make Fun of Jesus does make fun of fundamentalists, blacks, gays, gray-hairs and plain old vanilla white people of every persuasion. Sutton grew up poor, Southern Baptist and gay on the east side of Savannah, and she fled by joining a cult — but one so backward that the pastor told her to overcome her sexuality by putting on makeup and wearing a dress. After eight years there and two failed marriages (one to a man, one to a woman), Sutton is making comic hash of all of it and a whole lot else — going into impeccable dialects to impersonate her mom, the pastor and just about every ethnic group you can think of (to the vocal delight of the two African-American women in front of me). 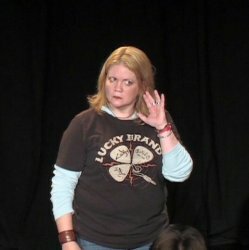 Sutton is smart, and her hilarious take-no-prisoners style captures the audience — even though she has the unappealing habit of scolding us when we don’t laugh hard enough and patronizing an older couple of audience members with the assumption that they’re totally out of touch. Sometimes people can’t be reduced to stereotypes, and Sutton, for one, should know that for sure. Thursday May 26, 7:50 p.m.
Friday May 27, 10:40 p.m.
Saturday May 28, 6:30 p.m.